Imagine a book about the American Founding Fathers that starts: "Jefferson wrote the Declaration as a Virginian. I have lived in Richmond since 1970 and so, as someone familiar with Virginians, let me explain what he meant by all men being created equal..." It would strike the reader as absurd. I wanted to like this book and I had very high expectations based upon the reviews here, but I was generally disappointed. One suspects (hopes?) that much more scholarship lies behind the assertions of Middle Eastern context than Dr. Bailey reveals, but with few footnotes and little explanation, the reader is often left with the impression that he is making the absurd leap that "if you were to read this parable from the perspective of Lebanon in 1984 you would think ______, therefore this is what it must have meant to Luke in the first century." When the author does reach back into historical Middle Eastern sources, he most often cites (32 times, more than all other such sources combined) Ibn al-Tayyib, an 11th century Persian Christian. al-Tayyib is himself a thousand years removed from the sources and represents a particular strand of Christian tradition. (Imagine citing a modern British exegete to explain what William the Conqueror's motivations, it may or may not be good scholarship, but his British-ness adds little to his credibility). The book is divided into six sections, each of which are stand-alone and build very little upon one another. If you are going to invest the time in this book I would suggest:Part 1: Birth of Jesus - very good and worth the time, some genuine insights from a Middle Eastern perspectivePart 2: The Beatitudes - go elsewhere for this, can be skipped in its entiretyPart 3: The Lord's Prayer - worth a quick read, some interesting insights, skim thisPart 4: Dramatic Actions of Jesus - skip this and pick up any N.T. Wright book on the subject. It will be more readable, more in-depth, and offers better Middle Eastern contextPart 5: Jesus and Women - worth a skim if you have not read an explanation of this elsewhere. If you are already familiar with first century attitudes toward women in Jewish and in Hellenistic societies from any of the alternative and excellent sources, this will seem superficial and won't add much.Part 6: The Parables - Worth the investment of time as there are some real gems here.The book abruptly stops after the Parable of the Vineyard. No concluding chapter or paragraph to tie it altogether because, sadly, this is less a book than a collection of essays stitched loosely together by a few recurrent themes.I would very much like to give this a more positive review, especially because the entire book exudes faithfulness and love of the subject. But I just do not think this merits anything close to the high marks given here. You can find much better treatment of nearly all this material elsewhere. This book is amazing! Bailey lived for 60 years in the Middle East, and has literally lived through the Bible story. The book begins with a stunning study, which presents a convincing case that Jesus was actually born in a house (since many poor, Middle Eastern homes actually have mangers in the house!). I won't give away the rest of his argument, but I did want to share another tid-bit that lept out at me.Speaking of the Magi, and who they might have been, he writes: "In the 1920s a British scholar, E.F.F. Bishop, visited a Bedouin tribe in Jordan. This Muslim tribe bore the Arabic name al-Kokabani. The word kokab means "planet" and al-Kaokabani means "Those who study/follow the planets." Bishop asked the elders of the tribe why they called themselves by such a name. They replied that it was because their ancestors followed the planets and traveled west to Palestine to show honor to the great prophet Jesus when he was born. This supports Justin's [Justin Martyr - ca. 165 A.D.:] second-century claim that the wise men were Arabs from Arabia," (Jesus Through Middle Eastern Eyes, 53). ****So, I've finally finished this! It took about three years to read, mostly because I had to fit into the cracks of my teaching and graduate school schedule. But, it was well worth it. Bailey's insights probably need to be digested over a long period of time, anyway, since they are so paradigm-changing. Nearly chapter had moments of truly deep insight, combined with pastoral applications throughout. I can't recommend this highly enough! Every pastor needs to read it, to avoid recycling some common misnomers about the Bible. A very illuminating and enjoyable read. Bailey approaches his subject with much knowledge and much humility. Sometimes he repeats himself, for example in his explanations of Biblical rhetoric or his fulsome praises of some of his favorite commentators. However that may have to do with the fact that some of the material was transplanted from his earlier writings. He uses his knowledge of Middle Eastern culture, languages and Bible commentaries to clarify the meaning of specific selections of the New Testament. He pinpoints and explains details of the Christmas narratives, parables and other passages that had hitherto puzzled me or even escaped my notice. He shows how Jesus drew material for his teachings from the cultural and religious heritage of Israel. However, as Bailey demonstrates, Christ did not hesitate to challenge and overturn some of the prejudices and limitations of his times, particularly in his attitude to women and to people who were generally considered undesirable. Again another fabulous book by Ken Bailey. Don't let the length of the book cause you problems. It is 400 pages, but each chapter is pretty much stand alone.Again, the insights that Dr. Kenneth Bailey gives to the culture during the time of Jesus is amazing. You will understand parables in a better way. You will understand why some sayings of Jesus offended the local Rabbi's in a way that you didn't catch with a casual reading.This books helps me to dig deeper into the real lessons behind many stories of Jesus's healings, parables and inneractions with the local people.You will not be disappointed. Enjoy the adventure with Dr. Bailey. I was quite excited to start reading Bailey's book on 1st century culture and the Bible. This subject was a significant part of my studies in seminary (biblical studies and cultural anthropology), and my years living overseas have only heightened my interest and expertise. I thought the first chapter was quite insightful.So, why the 1 star rating? A book like this is based on our trust of the author. Bailey makes a lot of assertions, and he is not using many footnotes, so the reader must trust the author. The first chapter augmented and agreed with things that I had already learned. However, as the book progressed, cultural studies gradually disappeared, and it became more about sharing anecdotes from modern Middle Eastern culture, about theology and finding "ring composition". Which is a problem for three reasons. One, cultures change over 2,000 years. Even Middle Eastern ones. Two, Bailey's theology is not really that good. Third, even a novice exegete should know enough to know that you can "find" ring composition (or chiasm as all modern scholars call it based on the Greek word chiasmus) in almost any piece of literature if you look long enough and are creative enough. So, why is Bailey calling it "ring composition". In my opinion, and I could be wrong here, he doesn't use the Greek word for it just to make it sound like an Aramaic/Hebrew literary device. That was troubling to me, but I didn't worry about it too much.More importantly, Bailey lost his credibility in my eyes as an expert on 1st century culture by making several key, critical errors. If he is making fundamental errors, then I cannot even trust those things that sound like they might be true (because there aren't footnotes). Examples of fundamental mistakes (in my eyes and the eyes of modern scholarship):1. Making arguments based on the grammar of the Aramaic original - What Aramaic original? This is mere speculation. We have no evidence from an Aramaic original, not one line, not one sentence. So, in essence, Bailey is making arguments from a possible Aramaic original that he must construct on his own and analyze. That is bad scholarship. Not totally uncommon, but still bad.2. Making arguments based on very sketchy readings of the Greek - For example, the beggar accepting Jesus as his "Lord". This is such shaky exegesis! May I offer an alternative cultural analysis? The beggar is a man of low status. He is addressing a rabbinical healer of high status. He uses Davidic titles out of respect, then addresses him as "sir" or perhaps "my lord" using exactly the appropriate, normal word to address someone of his status. To take this as a major theological claim of divinity on no further evidence ... ? Mere speculation again.3. The straw that broke the camel's back was taking "poor" in Luke 4 (quoted from Isaiah) as "humble". WOW! Major red flag! The other two mistakes were just over-reading the text. Those mistakes are easy to detect and not too terribly serious. But this one is a grave error. Even if you weren't an expert in first-century culture, if you were to read Isaiah, it would be absolutely clear that poor means poor, as in lacking possessions, food, etc. It is clear from the first chapter by implication and made explicit in Isaiah 3. Bailey actually reads Enlightenment era, Western pietist culture back into the text. In Isaiah, the rich haven't oppressed the humble and the orphan and the widow. The wages of the humble aren't crying out. I'm surprised Bailey didn't talk about setting the captives free as referring to spiritual captives. Unbelievable. The book of Isaiah is about social injustice being a sign of a lack of love for God and a failure to obey his laws. I have never read a scholar that has spiritualized poverty in Isaiah before. That doesn't mean those scholars don't exist. But I've been lucky enough to avoid them until now.I kept on reading for a hundred pages after I started to have misgivings about Bailey's expertise before I finally quit. I quit because of the Isaiah passage. An error of that magnitude means that even if there are awesome nuggets of truth buried in the book, I still can't trust them because I can't trust the author. I highly recommend this book, and it's on my list of books to buy for my library. It's highly readable by the layperson and filled with tremendous insight on Jesus and his teachings from a Middle Eastern perspective. It is a commentary, but without being academic and unreadable like many commentaries: each chapter covers the text, some comments and meditations on the text, and then a summary of take away points. I found it very practical to use in my bible study and devotional time. Great for discussions with the spouse as well.Dr. Bailey is well known for his several books on The Prodigal Son parable. He lived and taught in the Middle East for 40 years, so he has a very good understanding of Middle Eastern culture.Here's a description of the contents borrowed from Amazon:Beginning with Jesus' birth, Ken Bailey leads you on a kaleidoscopic study of Jesus throughout the four Gospels. Bailey examines the life and ministry of Jesus with attention to the Lord's Prayer, the Beatitudes, Jesus' relationship to women, and especially Jesus' parables.Through it all, Bailey employs his trademark expertise as a master of Middle Eastern culture to lead you into a deeper understanding of the person and significance of Jesus within his own cultural context. With a sure but gentle hand, Bailey lifts away the obscuring layers of modern Western interpretation to reveal Jesus in the light of his actual historical and cultural setting. Kenneth E. Bailey’s Jesus Through Middle Eastern Eyes: Cultural Studies in the Gospels is a treasure trove of cultural insights on the life and teachings of Jesus the Christ. Bailey pulls together writings, traditions, and perspectives both ancient and contemporary to help us better understand Scripture. Though it is written more for the academic, I would recommend this to anyone wanting a deeper understanding of Scripture. He writes that neither separating “the exact words of Jesus from the careful editing of the Gospel authors” nor authoring a “full-fledged technical commentary” are purposes of this book (20); rather, “My intent is to contribute new perspectives from the Eastern tradition that have rarely, if ever, been considered outside the Arabic-speaking Christian world” (21).The book is presented in six parts, each worth the reader’s time and energy:1. The Birth of Jesus2. The Beatitudes3. The Lord’s Prayer4. Dramatic Actions of Jesus5. Jesus and Women6. Parables of JesusMost people I know read the Bible solely from a Western tradition and perspective heavily influenced by the Enlightenment period, completely unaware of over a millennium’s worth of culture and writings predating those views that have been virtually ignored, often intentionally. Many thanks to Bailey for making some of this more accessible and bringing these things to light. Instructive and enlightening. I greatly enjoyed learning the cultural context of the gospels. A Western worldview (including the lenses of individualism and capitalism), combined with ignorance of first century Middle Eastern culture, distorts certain aspects of the Bible, all the worse for the distortion being invisible to the viewer. The New Testament makes so much more sense now, knowing how Jesus's audience perceived His actions and words and how He styled His message and deeds so they could understand. Additionally, understanding how Jesus was a master of Hebrew rhetoric and how He wove Old Testament references into His speech and stories creates a greater sense of cohesion of the Bible as a whole. Bailey's omission of the Oxford comma was annoying, and he occasionally chose odd paragraph breaks, but by the time I was halfway through the book I had mostly become inured to the eccentricities of his style. Since each chapter is an independent essay, there is a great deal of repetition of explanations, but not so much that it becomes tedious. The formatted diagrams highlighting the rhetorical forms (ring composition, step composition, et cetera) were quite helpful in showing the parallels in the text and the implications inherent in Hebraic literary forms. This is the book I've been searching for my whole life. It is basically a commentary on the gospels through the lens of Middle Eastern culture, and it is by far the best commentary I have read.I've always been a bit unsettled by Americanized biblical analysis and have longed for something that focused less on fitting the bible into my frame of reference and more on fitting me into Jesus' frame of reference. Well this is it! Kenneth Bailey has done a masterful job of setting the scene for gospels in a way that takes you right to the event as it unfolds, and explaining the context in a way that is understandable to the average American with little knowledge of historical Middle Eastern culture and custom. I have been brought to tears with new understanding of gospel stories that I've read so many times before and yet not understood. A truly transforming experience.I cannot recommend this book more highly. I will definitely seek out all of Kenneth Bailey's books and writings. 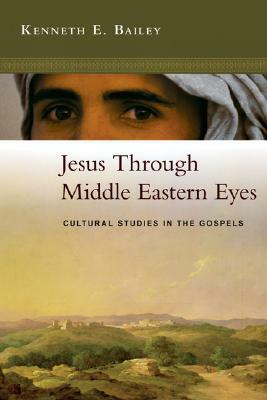 Kenneth E. Bailey's "Jesus Through Middle Eastern Eyes: Cultural Studies in the Gospels" opened my own eyes to a new perspective throughout the book. It was worth the read just to read his take on the setting of the Nativity. Bailey's style is not for the casual reader. This is an academic work and the author analyzes each passage first through its rhetorical style. To hear all of these stories/parables/accounts from a perspective so much closer to their original context is extremely helpful. I will want to return to this book for reference often. I heartily wish far more Christians from western cultures could read this book. When we read the Holy Bible without considering the original language or culture it was written in/to, we miss so very, very much! And worse still, we remain dangerously misinformed about what we think we do know. I know I'll re-read this book many times over. But, the reader has to be REALLY interested in the topic. The author does a great job of doing what he sets out to do - showing, since Jesus was from the Middle East, how the Middle Easterners interpret the Bible texts. That, of course, does not mean Jesus actually believed that way (probability is not the same and cause and effect), it is fascinating to get this perspective. This is very useful book. As it's a collection of articles and talks it does sometimes feels a little disjointed and incomplete, but it contains some wonderful corrective insights on our reading of Scripture through the middle eastern worldview - the original worldview of the biblical writers. Great book! The most excellent commentary I've read on the parables and sayings of Jesus. Particularly good at framing how Jesus fulfilled the Law, i.e., added or perhaps supplanted it with grace. Highly, highly recommended! Kenneth Bailey is an excellent scholar in the Middle Eastern culture, and he gives very important background information about the parables in the New Testament. Amazing start and then it gets a bit boring with all the ring stanzas, tho still has some interesting insight but feels more like reading study notes that a book. This is one of the best studies of the gospels of Jesus that I have ever read. Bailey includes a great deal of cultural information and a straightforward outlook that is astonishing. To be honest I found this book to be a real slog... but I’m glad I persevered. You will trawl through pages of tedium, but just as you’ve nodded of for the umpteenth time, you’ll stumble upon a revelation that makes it all worth while. One such example for me is how clearly he shows radical aspects of the teaching of Jesus that escaped my western worldview. Here’s an example:P147The inauguration of Jesus' ministry[Jesus' and remixing the Bible]Luke 4:16–31Jesus unrolled the scroll to Isaiah 61 and proceeded to read the text, which in Luke's Gospel shows careful editing. ... the text of Isaiah is changed or interrupted. In the first of them the phrase "to bind up the brokenhearted" is left out. The second is after an entire phrase has been brought in from Isaiah 58:6.… The word "to call" has been upgraded into a word that means "to proclaim a message. "… a verse has been cut in half with the second half omitted. Both the selection of the text and its editing are important. Why this particular text, and why these editorial changes? [Isaiah revised? Jesus takes a text which is well understood by the Jewish people to emphasise their superiority over the Gentiles, and intentionally remixes it to take away this emphasis and instead to replace it with an emphasis upon the whole world inclusive of Gentiles, this is why they wanted to kill him when he finished this reading]It is often assumed that Luke (or his source) did the editing. It is also possible to trace the editing to Jesus....For a long time English language versions have translated Luke 4:22–30 in a manner that presents a pleased audience that quickly turned into a howling murderous mob. Yet it is possible to understand the Greek text describing a congregation which is upset from the beginning. [Depending on how this is translated the same words can be understood as being framed as people speaking of Jesus with pride, or speaking of him with contempt, what follows is the more likely way of understanding the opening passage]In this case the question: "is not this Joseph's son?" Means "Didn't this young man grow up here!? Doesn't he know how we feel and how we understand this text?" Jeremias suggests that the congregation was angry because Jesus quotes "to proclaim the acceptable year of the Lord" but leaves out the second half of the verse, which reads "and a day of vengeance of our God. "Jeremias writes: "Luke 4:22 exhibits no break in the attitude of his audience towards Jesus. On the contrary it records that from the outset unanimous rage was their response to the message of Jesus. The good news was their stumbling block, principally because Jesus had removed vengeance on the Gentiles from the picture of the future. "...A careful look at the verses in the first section (stanzas 1-4) clarifies what Jesus read and what he left out. As noted, he omitted the phrase, "he has sent me to bind up the brokenhearted." Two lines later he borrowed a sentence from Isaiah 58:6 and added it to the reading. Finally he cut the final verse in half and deleted the phrase "and the day of vengeance of our God." ... His omission of the second half of the verse in 4 no doubt deeply angered the crowd in the synagogue. But his total omission of the second and particularly the third stanza in Isaiah was in all likelihood even more infuriating.The second section (stanzas 5–6) ensured comfort and gladness for the mourners. Leaving that material out could have disappointed some but would not have given offense. Jesus Through Middle Eastern Eyes: Cultural Studies in the Gospels is a book that seeks to look at the Middle Eastern Jewish context of Jesus' life and ministry. As 21st Century Americans it can be easy to lose the sense of what life was like two thousand years ago in the Middle East. Kenneth Bailey's goal is to try to give some of that context to help us understand Jesus' life, sermons, and parables a bit better.Overall, I think he largely succeeds, but the sections are a bit uneven. The first section is by far the best. It focuses on some of the realities around Jesus' birth. He paints a compelling vision for what it would have been like for Joseph and Mary which is a very different version that we tend to present in the western world. I haven't seen too many people who point out the things the Bailey does about the culture and how that would help us understand the circumstances around Jesus' birth.The other sections are much more hit or miss. His parts on Jesus' parables and Jesus' interaction with women are probably the next strongest sections. This is followed by what he calls "Dramatic Actions of Jesus". His weakest sections are probably the parts on the Beatitudes and The Lord's Prayer. Not that any of these sections are terrible, it's just that they don't provide quite the treasure trove of insights that his section on Jesus' birth does. The only real annoyance that I had with this book is Bailey's almost slavish adherence to the idea of ring composition. Almost every section he talks about he brings it up. Sometimes his analysis is convincing, other times it is not. It is an interesting way to think about the passage, but it just felt like it was forced a number of times too. Overall, I felt that Jesus Through Middle Eastern Eyes was an interesting book that tries to help recapture a bit of the Middle Eastern culture surrounding Jesus' ministry. He starts off phenomenally with this goal, but because of that fantastic start it made the rest of the book feel a little underwhelming. It is still a solid look at a number of stories about Jesus and parables that Jesus taught, but a strict adherence to the idea of ring composition can get a little old. I enjoyed it and really his section on Jesus' birth is worth the price of entry, everything else is just bonus. Beginning with Jesus' birth, Ken Bailey leads you on a kaleidoscopic study of Jesus throughout the four Gospels. Bailey examines the life and ministry of Jesus with attention to the Lord's Prayer, the Beatitudes, Jesus' relationship to women, and especially Jesus' parables. Through it all, Bailey employs his trademark expertise as a master of Middle Eastern culture to lead you into a deeper understanding of the person and significance of Jesus within his own cultural context. With a sure but gentle hand, Bailey lifts away the obscuring layers of modern Western interpretation to reveal Jesus in the light of his actual historical and cultural setting. This entirely new material from the pen of Ken Bailey is a must-have for any student of the New Testament. If you have benefited from Bailey's work over the years, this book will be a welcome and indispensable addition to your library. If you are unfamiliar with Bailey's work, this book will introduce you to a very old yet entirely new way of understanding Jesus. I found this book in equal parts enlightening and infuriating. The cultural insights were generally very helpful especially where they challenged my tendency to read through my western contemporary spectacles.What I found less helpful was a recurring theme of the rhetoric template which seemed rather artificial. I also was irritated by examples of dogmatism. (This is what the text means rather than this is an alternative to think about. )The final chapter is a good example. He speaks of Isaiah's vineyard illustration and compares Jesus' one but I cannot escape the thought that, vineyards being common, both Isaiah and Jesus used them as a basis for teaching. It also was strange that he made no mention of the 7 unmentioned servants!This book came highly recommended by two separate individuals but I could only recommend it with some reservations. I've never read a book analyzing biblical texts and been so amazed at how little I previously understood about the context and historical background of a passage. Bailey takes parables and passages that have meaning for Westerns and pulls back the curtain to reveal even deeper (and at times almost contrary!) meaning. I don't have time to count how many times I wrote "Wow!" in the margins of this book. I finished this book with a deeper love and sense of awe toward Jesus. One of the most eye opening and engaging commentaries of the gospels I've ever read. The last two sections on Jesus and women and Jesus and the parables are outstanding and I'm certain I'll be referencing them often. Accessible, fascinating, convincing and awe-inspiring. Really good. You have to keep the big picture in mind and not get bogged down in all the minutia of his rhetorical analysis. If nothing else this gives you an appreciation for the artistry and high-structure of the the Gospels, especially the parables. Bailey demonstrates how ethnocentric we can be in interpretation if we aren't careful to understand the original cultural-historical understanding. Very readable (if you don't get bogged down in the charts). Incredibly eye opening. I have read the New Testament many times but always through my Western cultural lens. Kenneth Bailey does an excellent job of introducing the reader to the Middle-Eastern world that Jesus and the Gospels were written in and originally understood. Excellent resource for scholars, pastors, or those who want to understand the content of the Gospels better. Incredible insight into the stories and parables of the New Testament!The cultural insight offered here is valuable beyond compare. The author strips away our Western cultural assumptions and clearly redefines the familiar parables of the New Testament according to the middle eastern culture in which they were first told! Excellent! Bailey's insight on the culture of the Middle East and his thorough understanding of biblical manuscripts brings light and depth of understanding to many passages, both those which were previously confusing and those which seemed familiar. Kenneth E. Bailey - After undergraduate and seminary studies, Dr. Bailey completed degrees in Arabic Language and Literature, Systematic Theology and a doctorate in New Testament. Ordained by the Presbyterian Church (USA), Dr. Bailey spent 40 years (1955-1995) living and teaching in seminaries and institutes in Egypt, Lebanon, Jerusalem and Cyprus.For 20 of those years Dr. Bailey was Professor of New Testament and Head of the Biblical Department of the Near East School of Theology in Beirut where he also founded and directed the Institute for Middle Eastern New Testament Studies. From September 1985 to June 1995, Dr. Bailey was on the faculty of "The Ecumenical Institute for Theological Research" in Jerusalem, with the title of Research Professor of Middle Eastern New Testament Studies.In 1990 Dr. Bailey accepted the additional responsibility of Canon Theologian for the Episcopal Diocese of Cyprus and the Gulf, residing in Nicosia, Cyprus and returned a third of each year to Jerusalem to continue teaching at the Ecumenical Institute.Dr. Bailey's area of specialty is the cultural background and literary forms of the New Testament. In addition to more than 150 articles in English and in Arabic, his writings include: Jesus Through Middle Eastern Eyes (Downer’s Grove: InterVarsity Press, 2008) “Open Hearts in Bethlehem (A Christmas Musical)” (Louisville: W/JK, 2005) The Cross and the Prodigal [Revised edition] (Downers Grove: InterVarsity, 2005) Jacob and the Prodigal: How Jesus Retold Israel’s Story (Downers Grove: InterVarsity, 2003 ) Finding the Lost: Cultural Keys to Luke 15 (St. Louis: Concordia, 1992) Poet and Peasant and Through Peasant Eyes (Grand Rapids: Eerdmans, l980) God Is Dialogues on the Nature of God [Revised Edition] (Toronto: FFM, 2005)Dr. Bailey has authored the scripts for two professionally produced feature length films and has also professionally recorded more than 100 video lectures on a variety of New Testament themes. He has taught at Columbia and Princeton and was for a time an adjunct professor at Dubuque, McCormick and Pittsburgh theological seminaries as well as at Fuller Seminary. Dr. Bailey has lectured in theological colleges and seminaries in England (Oxford, Cambridge, Bristol) Ireland, Canada, Egypt, Finland, Latvia, Denmark, New Zealand, Australia and Jerusalem. He is active as a Bible teacher for conferences and continuing education events in the Middle East, Europe and North America. His writings have been translated and published into more than 20 languages. He is a member of Studiorum Novi Testamenti Societas and is listed in Who's Who in Biblical Studies and Archeology (Washington: Biblical Archeology Society, 1992). In March 1995, at the request of the Archbishop of Canterbury, Dr. Bailey was the Bible teacher for the triennial meeting of the Archbishops of the Anglican Communion. In 1999 he received the Pittsburgh Theological Seminary “Distinguished Alumni Award for Excellence in Academics.” In 2003, at the invitation of the Archbishop of Canterbury, he participated in a Muslim-Christian dialogue conference held in Doha, Qatar.The Baileys now reside in New Wilmington, Pennsylvania. Dr. Bailey continues his ministry of lecturing, writing and recording in the field of New Testament. In June 1997, he was installed as Canon Theologian of the Diocese of Pittsburgh of the Episcopal Church, USA.Mrs. Ethel Bailey was a research assistant to Dr. Jonas Salk at the time he discovered the polio vaccine. She taught microbiology (in Arabic), raised a family, and typed a number of Dr. Bailey's manuscripts. In Beirut she was the recording secretary for the board of the American Community School. While in Jerusalem she was active in the leadership of daily worship at the Tantur Ecumenical Institute and in various other aspects of the life of the community. The Baileys have two children.